As I was driving home tonight I thought to myself, "What a perfectly ordinary day!" It seems the days we tend to remember are the days with all the razz a ma tazz. Today didn't have any razz and not a lot of tazz...and that was very good. I remember seeing a video one time called "The Estate Sale." It struck a real chord with me since I love going to garage sales and estate sales. The premise of the video was this old woman had died (o.k. 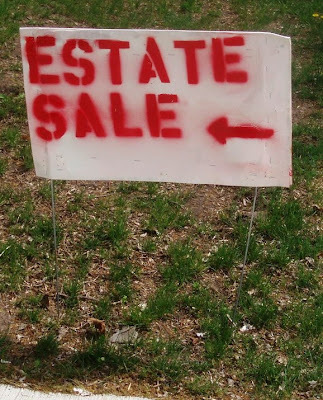 you probably figured that one out) and the estate sale was taking place. People were perusing all the things that had been hers. A couple of women at the estate sale were looking at the woman's items and wondered aloud what she was like, what made her happy or sad. The video then flashed back to the old woman who had died and her family as she was raising her children and enjoying being a homemaker in many years gone by. As the video went on, the woman who had died became older. The children were grown and she was all alone. She was saying to herself that she wished for just one more "perfectly ordinary day." That poignant video has stayed with me for a long time. I want to live each day. Really live. I want to look people in the eye and be in the moment. I want to listen. Really listen to what others are saying, not only with their words, but with their heart. I want to love others every day. Really love. Not just my family and those I'm close to but all I come into contact with. If I get the opportunity to grow old, I don't want to have any regrets. I want to be thankful for what was...and is.. and accept it all as a part of God's plan. What a perfectly ordinary day. Ok, after the post I just did, this brought tears to my eyes. It's been an ordinary day here too, just a crazy teenager infused one. Love this post like all of yours! And...there seem to be some crazy similarities between you and me. I love estate sales....but they always make me sad. I love days when we have nothing to do but be together and do nothing. Like you said 'razz a ma tazz' days may make for fun memories, but those special, ordinary, do nothing days are the best.